Chrichton's World: Review Kingsman: The Golden Circle: The hate for this sequel is unfounded. It's a blast like it's predecessor. Review Kingsman: The Golden Circle: The hate for this sequel is unfounded. It's a blast like it's predecessor. Kingsman: The Golden Circle was one of the titles I absolutely wanted to see this year and I am happy to report that it doesn't disappoint. 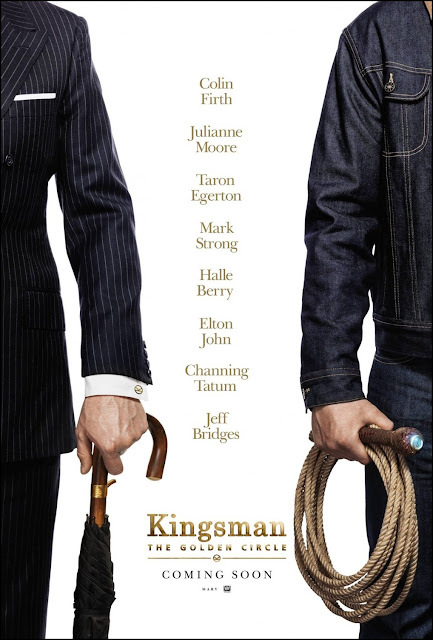 It might not be entirely mind blowing as the original but it is filled with those elements that made Kingsman fun. So the hate and negative criticism is very much unfounded. People seem to forget that Kingsman came out of nowhere. It was a parody and homage of James Bond and offering what those Bond films used to deliver. But it was more than that. It had heart and soul making it appeal to people who previously weren't interested in these kinds of films. Kingsman was a pleasant surprise to many and naturally it is hard to top that once you have been introduced to it. Critics have been claiming that The Golden Circle suffers from what most sequels suffer from but I disagree. Sure it offers more of the same or nods to the things that are familiar but it also has elements that were surprising. Actually if I think about it. This sequel is more about the relationships and dynamics between main character Eggsy and the persons who are the most important to him. Like in the Bond films and other films in the genre it is expected of the main character not to care too much and discard emotion since it will get in the way of getting the job done. But Eggsy basically proves them wrong since it is exactly those feelings that give him the drive to make him accomplish the things he is set out to do. The most enjoyable scenes are the ones where Eggsy is interacting with Galahad, Merlin and Princess Tilde. How about that? Human interactions are more fun than all the spectacle! Of course I was surprised and worried about Colin Firth coming back. His character died and to make him come back is risky. While completely preposterous it was nice how they made that happen. Was it necessary for him to be brought back? The original was the making of Eggsy becoming one and basically Galahad paved the way for him to do that. In that light Galahad should have remained dead. However I can see why he is brought back. He is there for Eggsy's sake. And not only brought back out of fan service. Galahad (Colin Firth) continues the role of the mentor by showing how flawed and imperfect his life was. But he does more. He gives Eggsy his approval and blessing normally a father would do. The whole plot concerning evil mastermind Poppy (Julia Moore) is just there to serve as one of the many life or death missions Kingsmen have to carry out since it is their job to. Not to say that Poppy is not interesting as the main villain. She is but she is not the main focus. And I guess that this is what a lot of people seem to have issues with. To be fair I had hoped or expected the same. But then I realized that the best scenes were the moments that got to me emotionally because of the connection we have to the characters we have grown to love and care about. Kingsman: The Golden Circle will offer the action, spectacle and laughs you expect with even more crudeness. Perfectly in line with the original so if people now suddenly are shocked they should watch the original again. But like the original this film has heart and is not just a lazy sequel as claimed.